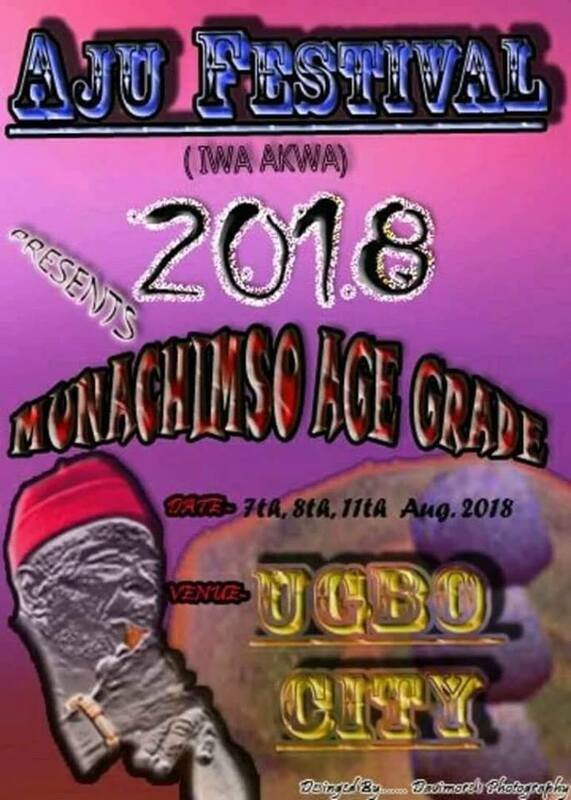 Its yet another festive season in ugbo calendar.. Come 7 to 11 of august the ancient town of Ogulugu will play host to thousands of visitors as well as its illustrious sons and daughters as they turn out in their largest number to celebrate their sons as they perform their ”Iwa Akwa” Their rite of passage to manhood. Aju festival is one of the major cultural landmarks in Ugbo traditional calendar and a significant process in, not just Ugbo, but also in many Igbo societies. The festival is a chain of ceremonies performed every three years to mark the Rite of Passage for males from adolescents into manhood. The celebrants are males between the ages of 20 and 24. , called Iwa Akwa (clothing) is the most cherished festival in the life of every Ugbo indigene. Aju festival dates back to Ugbo history. Our ancestors conceived it as a classificatory process of grouping males into specific age-grades for smooth and effective communal administration. On the other hand, both seniority and age grade are seriously emphasized such that in Ugbo, old age goes with honour, dignity and gerontocratic rights. Iwa Akwa involves various social processes aimed at initiating the adolescents into manhood as well as bonding the members of the age-grade across the entire hamlets of Ugbo. The initiates are in the process, fully incorporated and enculturated into the core Ugbo essence and traditional cosmology. Apart from impacting the Ugbo consciousness in the initiated, the Iwa Akwa confers on the celebrant all the privileges, rights, dignity and profound sense of belonging in the Ugbo society. Iwa- Akwa also goes with some challenges. The celebrants are reminded as in Corinthians, 13 Vs 11: “As a child, I spoke, thought and understood as a child. Now, as a man, you must put away all the childish things’’. It is the occasion for the central message: Go ye into the world, tread cautiously as an Ugbo indigene with an achievement ambiance. Put differently, any male who has not performed the Iwa Akwa ceremony is considered a minor in Ugbo. Going by the standards of Ugbo custom and tradition, such a minor may not only be allowed to marry but will not be entrusted with serious responsibilities in the community. Expectedly, every Ugbo parent looks forward with emotional excitement, to a day his/her son will perform this right of passage ceremony [Iwa Akwa] . It is considered a thing of immense joy for a parent to witness the rite of passage of his/her son. It is greeted with enormous fanfare, gunshots, feasts, dancing groups, etc. Because of the relevance attached to the Aju festival, all sons, daughters and friends of Ugbo both at home and in the Diaspora usually strive to participate in the festival.